The press conference had all the ingredients — the senator, the National Guard general, the chaplain and the psychiatrist. 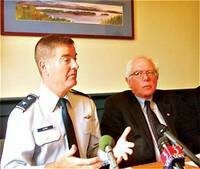 But, unlike in the 1960s, within hours the conference was online for any and all to see on Independent U.S. Sen. Bernie Sanders’ very snappy website touting the Senator’s first-in-the-nation, $1 million annual grant for the Vermont Guard to identify Iraq war vets suffering from post-traumatic stress disorder (PTSD). It’s just what the doctor ordered, and Congress should appropriate $30 million more and take it national! Fine. Sounded like apple pie and motherhood to this journalist, but things got a bit testy when the questions turned to policy. Adjutant General Mike Dubie (brother of GOP Lt. Gov. Brian Dubie) insisted the military now speaks openly to the troops about PTSD before they leave Iraq to come home. Dubie told the press the military was determined not to stigmatize the affliction. But even though medical diagnoses are issued, Gen. Dubie adamantly refused to say how many Vermont Guard troops have been diagnosed with PTSD. Here we have a U.S. senator holding a press conference in the largest city in his state involving the hottest topic of the day — the Iraq war — and nobody wants to talk numbers? It appears the prep-meeting before the press conference emphasized not giving out one fact in particular: the number of Vermont soldiers coming home from Iraq diagnosed with PTSD. If one has that number, you see, one can calculate the cost per victim, and that was a dollar figure it appears Sen. Sanders was determined not to provide. Forty years ago, Democratic President Lyndon Johnson was just as determined not to provide the facts to the public about what was really going on in South Vietnam. It was a truth so powerful, it caused LBJ’s decision not to seek re-election in 1968. But we’ve learned the lessons of Vietnam, right? So we considered it a fair question to ask General Dubie his understanding of the justification for the latest shipment of Vermont Air Guard troops to the Iraq war zone. What exactly are they fighting for? Not a question our adjutant general enjoyed. A lesson of Vietnam, right? That one could hate the war but not the warrior. As for why Vermont troops are going to Iraq? Good soldiers. Just like in Vietnam, eh? And with that, Gen. Dubie and the other Veterans Administration officials rose and departed, leaving Vermont’s freshman senator to handle the “policy” questions from the Fourth Estate. Sanders noted there will be a debate in the Senate this week on a timeline for bringing our troops home from Iraq. Sanders said he agrees with Republican Sen. John Warner of Virginia who now says the original congressional resolution giving the Bush-Cheney White House the green light to invade Iraq has expired. A new one is needed. The original congressional Iraq war resolution gave the White House authority to take out Saddam Hussein and his weapons of mass destruction. Saddam Hussein has been executed. His WMDs, we learned, were nonexistent. When will GOP defection increase? But the leading socialist in the U.S. Congress — OK, the only socialist in the U.S. Congress — predicted mounting Republican defections from the dishonest Bush war train. Maybe so, Senator, but it is painful to watch. Iraq is going to need a new name when the current civil war is over one day, right? Thanks, George. The C-student at Yale became an “education” president, after all, eh? Bush Invite — President Bush’s speech at the Naval War College in Newport, Rhode Island, in late June leaves Vermont on its own as the only state in the Union he has not set foot in. It leaked out under questioning from “Inside Track” that Ol’ Bernardo has, in fact, personally invited Dubya to end the shut-out. Sanders said he extended the invitation to Mr. Bush at a White House function a couple months ago. Ah! Our junior senator watches C-Span! The President of the United States deserves to be treated with respect, said Sanders, but he should appear before the American people, not just sanitized, partisan audiences. The Douglas Angle? — One reason President Bush should come to Vermont is that our governor is also a Republican! And last week, Jim Douglas reminded everyone he is a skilled Republican indeed, as majority Democrats under the Golden Dome failed to override not one but two line-in-the-sand gubernatorial vetoes of bills dear to the hearts of Statehouse Democrats: climate change and campaign finance reform. At Saturday’s Democratic Party State Committee Meeting, House Whip Floyd Nease took some heat from members of his party’s center core. Can’t legislative Democrats count? If they knew they didn’t have the votes, why the hell did they convene the override session? Floyd the House Whip admitted he knew the count. It’s his job to know. But leadership decided to proceed anyway. “I think it was an opportunity to hold Gov. Douglas accountable,” said Nease, “even if we lost the votes.” The Whip pointed to the editorial supporting the Democrats and criticizing Douglas that ran in the following day’s Rutland Herald. True enough, El Floydo, but fewer people read daily newspapers than used to. And the Rutland Herald isn’t even delivered to Big Bad Burlington anymore. State Committee Member Bill Sander of Jeffersonville informed Nease and the others that last week’s two veto victories for Gov. Douglas provided little in the way of new information about him. “The guy’s a fascist with a smile,” Sander told the state committee. The classic-car collector from Lamoille County told fellow Democrats that Gov. Douglas “comes out looking like an effective leader with a plausible explanation if you don’t look at it too carefully. And most folks don’t,” he said. Not so, and the Whip ate some crow over it this week during a phone interview with “Inside Track.” In fact, Entergy Inc., owners of the Vermont Yankee Nuclear Power Plant in Vernon, only had one professional Statehouse lobbying outfit on their hired-gun dance card. It was the Burlington-based firm of Morris DeMag & McCarty. “Up in St. Albans,” continued Nease the Whip, before fellow Dems at the state committee gathering, “the publisher [Emerson Lynn] moderated a forum where it was really difficult for people who had a view other than his and other than Entergy’s to get their views heard. That’s the kind of work that went into this,” whined the Whip. “IBM worked very hard against this bill,” he told questioning Democrats. Our impression was, the Majority Whip’s whining didn’t fly with the rank and file. The fact that Vermont Democrats just lost on global warming and campaign finance reform is an “inconvenient truth” that suggests Jim Douglas may be governor for quite some time. And the party’s Statehouse leadership may be feeling some heat from within.